1. Stuff a paper lunch bag with about seven crinkled up plaster grocery bags to about 2 1/2" from the top of the bag. You can also use crinkled up newspaper or recycled papers. 2. Fold the sides together and flatten the top of the bag. 4. Fold down the top of the bag right under the folded down corners and glue it down. 5. 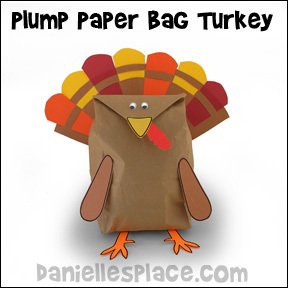 Cut out a beak, waddle, legs, and wings from construction paper and glue them to the bag. The tail feathers pictured above are woven into a tail pattern to make a tail that is a single piece. 6. To finish glue on wiggle eyes. Pumpkin pie paint makes a great sensory craft for children! 1. Mix the spices into any orange paint. 2. 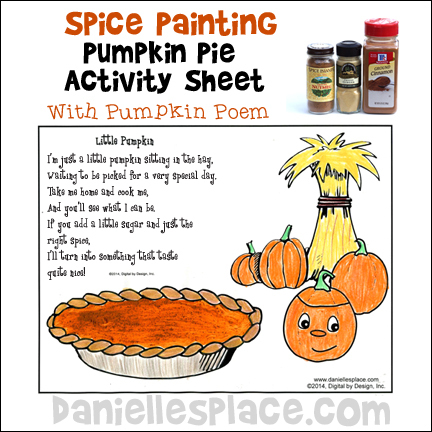 Print out the Pumpkin Pie Activity Sheet with the Poem, or print the poem onto a sheet of paper and have your children paint pumpkins and pumpkin pie to go with the poem. Waiting to be picked for a very special day. And you’ll see what I can be. I’ll turn into something that taste quite nice. ©2014, Digital by Design, Inc. -See Copyright Information Do not publish this poem or a derivative of this poem any where without permission. 2. Place two sticks together, side by side, long ways, and tape them together covering both the sticks with the tape. 7. 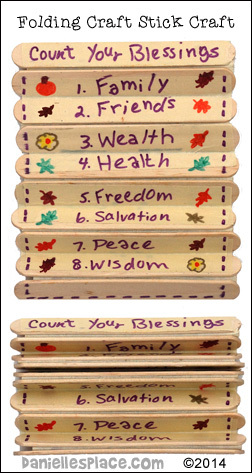 Write "Count Your Blessings" on the top craft stick and then number the rest of the craft stick. List your blessings on each stick and then decorate the sticks. 9. Glue a ribbon on the top of the row of craft sticks. ©2012, Digital by Design, Inc. -See Copyright Information-Bloggers, if you use this craft idea or an adaptation, you must link back to this page for complete directions. 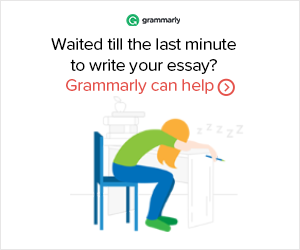 If you use this technique, let us know and we will put a link to your blog. 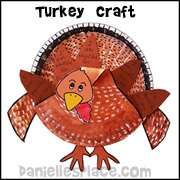 Fun creative Thanksgiving craft for children! 1. Cut a sliver off of one side of the foam ball so that it will sit flat on a table. Paint or spray paint the ball brown and let it dry. 2. Cut six Chenille stems into four-inch pieces. 3. To make the turkey's tail feathers fold ten of the four-inch pieces in half and poke them into the foam to form the tail feathers. 4. To make the turkey's head use a butane lighter to soften the plastic spoon in the middle of the scoop. Hold the flame just below the center of the scoop and move it back and forth until the plastic softens. (The diagram pictured is not a spoon, but is shows how to use the lighter to soften the plastic.) As soon as the plastic softens fold down the tip. Hold it in place a few seconds until the plastic cools. Cut off the handle of the spoon leaving about two inches for the neck. Stick the spoon into the foam ball. 5. Bend two more four-inch Chenille stems into wing shapes and stick them into the foam ball. 6. To make the legs cut two, two-inch pieces of Chenille stems and fold them in half. 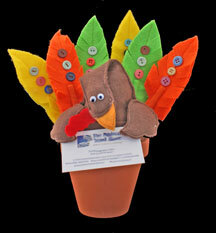 Use a four-inch piece and wrap one end of the four-inch Chenille stem around a folded two-inch piece at the fold leaving one-inch of the stem to form one of the turkey's toes (see diagram). 7. To finish cut a waddle from red craft foam and a beak from yellow or orange craft foam and glue them under the bent part of the spoon. Glue on wiggle eyes. 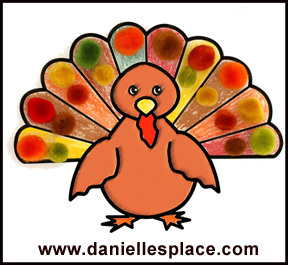 Children will enjoy decorating pictures of turkeys to display for Thanksgiving. 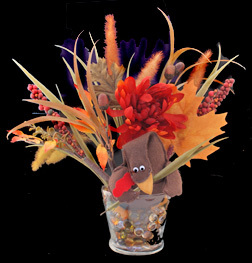 A wide variety of items can be used to decorate pictures of turkeys including: pompoms, colored noodles, buttons, dried seeds, and Fruit Loop cereal. Printable Patterns in both color and black and white are available to members. 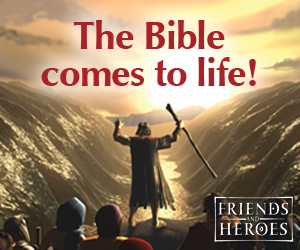 Also available as an instant download with the Beat the Greedies Bible Lesson. 1. Find one puzzle piece for the body that has three bumps, one for the head, and two for the wings. 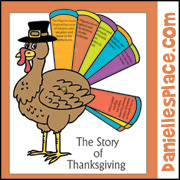 You will need three more puzzle pieces to make the turkey's tail. 2. 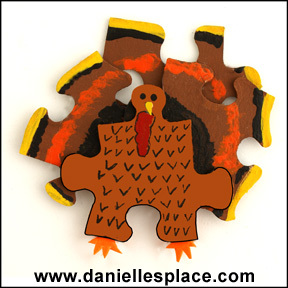 Paint the puzzle pieces with acrylic paints. 3. When the paint dries use a permanent marker to add the details and glue the pieces together. 4. Cut turkey claw shapes from craft foam and glue them to the body. 5. To finish glue a pin or magnet to the back of the turkey. 1. Cut a piece of brown construction paper to fit around the pop can and tape of glue it to the can. 2. 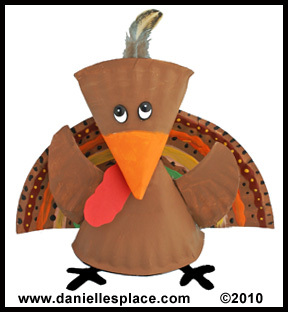 Cut wings, feet, and beak shapes from the construction paper and glue it to the turkey body. 3. 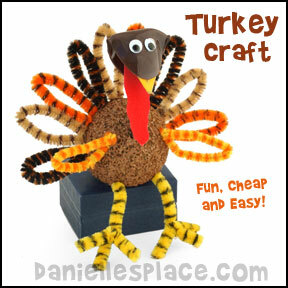 Bend pipe cleaners in half and glue them to the back of the turkey. 4. To finish glue on google eyes. This is a Great Craft to Use in a Doctor's or Veterinary's Office. 1. Print out the pattern for the turkey. Cut the turkey's body and wings from the brown felt, the beak and feet from the gold felt, and cut a wattle shape from red felt. You will not need the front and back pouch patterns for this craft. 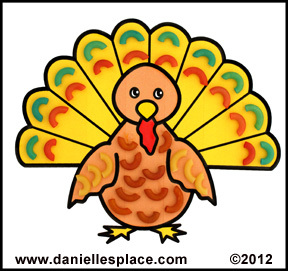 The pattern for the turkey is available as an instant digital download, below. 2. Pin the two beak pieces together and sew them together using a very small stitch. Cut around the edge of your stitching close to the seam. 3. Pin the two body pieces together in the middle. Place the beak inside the two pieces at the head and pin the pieces together. Place the top edge of the two feet in the inside of the body pieces and pin them in place. Sew the pieces together leaving an opening on one side to fill it with the polyfil. Stuff the head and the rest of the body, but not the neck. Then sew the body closed. 4. Place two wing patterns together and sew all the way around leaving a one-inch opening. Stuff a small amount of polyfil in the wing and then sew it closed. Do the same thing for the other wing. Glue the wings to the body. 5. Bend down the head as shown in the picture and glue on googly eyes and a wattle. 6. Place silk fall foliage on the pens and wrap them with floral tape or duck tape to secure them to the pens. Note: You don't have to use pens, you can just push the silk foliage into the rocks and use the craft as a Thanksgiving dinner table center piece. 7. Place glass rocks in the glass container, and the turkey on top of the rocks. Push the pens into the rocks behind the turkey making a nice arrangement. Glue some foliage on the turkey's wings so it looks like it is holding them. 1. To make the body roll one end of a brown Chenille stem into a circle about 3/4 of the way. To make the head roll the other end into a circle to meet the first circle. 2. Cut an orange Chenille stem one inch and fold it in half to make the beak. Glue it to the head. Cut a red Chenille stem one inch and fold it in half to make the waddle. Glue it to the head. Glue on a googly eye. 3. To make the feet cut an orange Chenille stem two inches long and another one inch long. Fold the two inch stem in half and wind it around the one inch stem. Make two of these and glue them to the body. Cut one-inch lengths of different colors of Chenille stems and glue them on for the feathers. 4. To make the pencil topper wind another Chenille stem around the top of a pencil and glue it to the pencil. 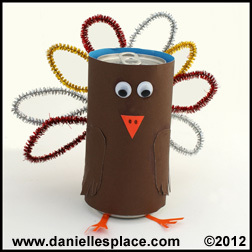 Glue the turkey to the Chenille stem on the pencil. 5. To make the broach glue a pin back to the back of the turkey. 6. Cut feather shapes from different colors of felt. Sew two feathers together in the middle and leave an opening for the top of the pens. Glue or sew buttons to the top of the feathers. Slide the feathers on the pens. 7. Place glass rocks in the pot, and the turkey on top of the rocks. Push the feathered pens into the rocks behind the turkey. 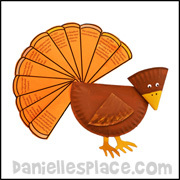 Glue a business cards, sign, or other object on the turkey's wings. 1. Fold a small paper plate in half and cut on the fold line. 2. To make the head roll one half of the plate into a cone shape overlapping the sides about 1/3 of the plate. Glue the cut side closed. 3. To make the body roll the other half of the paper plate into a cone shape overlapping the side only about one inch at the edge. Glue the cone closed on the cut edge. Fold the tip of the cone down about 1/2" and glue the head to the folded tip. Paint the head and body. 4. Cut another paper plate in half and use one half for the back tail feathers and the other half for the wings and feet. Paint the tail feathers and wings and then glue them to the body as shown in the picture. 5. Glue on the eyes. To finish glue a feather to the top of the head and cut a wattle from red paper and glue it to the underside of the beak. 1. Cut a two-inch piece off a TP roll or make a two-inch roll using card stock. 2. Cover the roll with brown felt. Start by closing up the bottom. Place the roll on the felt and trace around the bottom of the tube about one-half inch from the edge. Glue the circle on the bottom of the tub by bringing the extra half inch up over the sides of the tube and gluing it to the sides. Cover the entire side of the tube with the felt. 3. 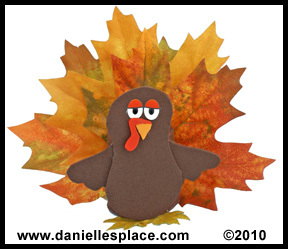 Print out the turkey pattern and cut from brown craft foam. glue the wings to the back of the body as shown in the picture. Cut the wattle from red craft foam and the beak from orange craft foam and glue them to the face. Glue on eyes or use eye stickers. 4. Glue three large leaves to the back of the tube to make the turkey's tail features, and glue two tiny leaves to the bottom of the tube for its feet. 5. Place candy corn or other treat in the TP roll holder. Card stock or light card board, craft foam, black acrylic paint,Aluminum Duct Tape(You can find this tape at a Lowe's or other home improvement store in the heating and air conditioning section. It costs about $7.00 for 120 yards. It is not Duck tape. ), and utensils to engrave the tape such as a ballpoint pen, the end of a paintbrush, and the tines of a fork. 1. Cut pieces of duct tape 7" long. Cut card stock in 6 1/2" by 1 1/2' pieces. 2. Place the duct tape pieces on a piece of craft foam and use utensils to engrave a design. The craft foam makes it easier to engrave because it is soft and springy. 3. Remove the backing on the pieces of engraved tape and stick them to the card stock pieces folding over the edges. 4. To make the rings look old paint black acrylic paint over the entire surface then pat off the extra paint with a dry folded paper towel. 5. When the paint is dry roll the pieces to form a ring and glue the rings closed using hot melt glue. 1. Print out the pattern. Cut the turkey's body and wings from the brown felt, the beak and feet from the gold felt, and cut a wattle shape from red felt. 3. Pin the two body pieces together in the middle. Place the beak inside the two pieces at the head and pin the pieces together. Pin the front and back pouch to the front and back of the body. Place the two feet in the inside of the body pieces and pin them in place. Sew around the head and about two inches of the neck on both sides. Insert a small rock or other heavy object in the head and then continue sewing all the way around the body. 6. If you are using a plain napkin, sew rickrack or other decorative items such as lace on the edges. Fan fold the napkin, iron it, and then fold the fan-folded napkin in half. 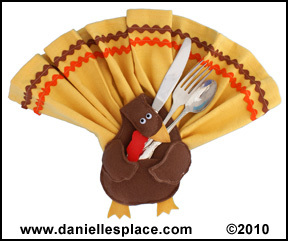 Insert the napkin in the back pouch of the turkey and spread out the napkin to make a fan shape. Place silverware in the front pouch and then fold the head down over the silverware. 1. Print out the Pattern for the wings, feet, wattle and beak and cut the shapes from construction paper. 2. Crinkle up one page of newspaper and stuff it into a brown lunch bag. Plastic grocery bags also work very well. 3. Close up the bag by crinkling the sides together about 2/3 of the way down from the top of the bag. Wind a rubber band or Chenille stem around the bag just above the stuffed newspaper or grocery bags. 4. Cut from the top of the bag down to the rubber band or chenille stem in the middle of the back of the bag. 5. 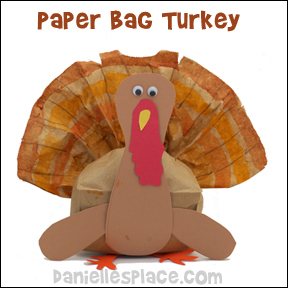 Spread the bag out at the top to form the turkey's tail feathers. 6. Paint or color the tail feather and let them dry. 7. Glue or tape on the turkey's body parts. Discover Thanksgiving with the Berenstain Bears! The cubs are putting on a Thanksgiving show for their relatives. This entertaining and historical story shows that the actual hero of the first Thanksgiving was neither white nor Indian, but God. In 1608, English traders came to Massachusetts and captured a 12-year-old Indian, Squanto, and sold him into slavery. He was raised by Christians and taught faith in God. Ten years later he was sent home to America. Upon arrival, he learned an epidemic had wiped out his entire village. But God had plans for Squanto. God delivered a Thanksgiving miracle: An English-speaking Indian living in the exact place where the Pilgrims land in a strange new world. Recommended for ages 5 to 10.